Please say hello and welcome to Eli! Eli the elephant is the new logo for the Secondary Breast Cancer focus group at The Christie hospital in Manchester, a group which I’m proud to be part of. The Secondary Breast Cancer focus group at The Christie was formed following the launch of the Secondary Breast Cancer pledge in March 2014, a national initiative aimed at improving standards of care for people diagnosed with secondary breast cancer. I’m lucky enough to get treated at a hospital where I have access to a clinical nurse specialist (or Breast Care Nurse), along with many other support services. However for many living with Secondary Breast Cancer, this isn’t the case. Many patients don’t have access to a clinical nurse specialist or are living with unnecessary pain because they haven’t been referred for palliative care. The Pledge aims to ensure that all patients with secondary breast cancer get the highest possible standards of care. When I joined the focus group earlier this year, they were working on a project with Breast Cancer Care, to update information contained in secondary breast cancer resource packs. Ideas and feedback generated by the group, are now being put into practice, and will be incorporated into the resource packs given to patients at diagnosis. 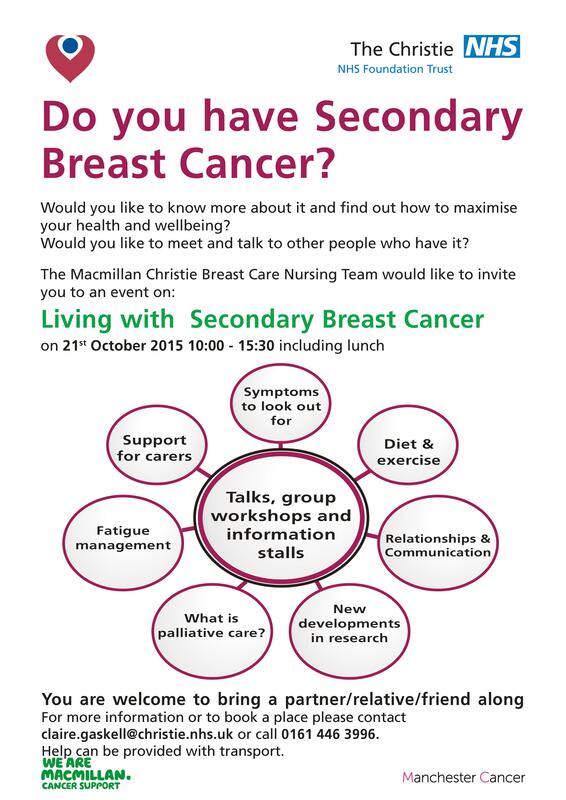 More recently the SBC team at The Christie received funding from Macmillan and Manchester Cancer to hold a series of “Living with Secondary Breast Cancer” events at The Christie. At the first “Living with Secondary Breast Cancer” day in July, more than 50 patients and carers attended, with talks from various cancer specialists, along with workshops for both patients and carers. Secondary cancer can be a lonely and isolating experience for patients and events like this are a lifeline. For as well as allowing patients to gain knowledge and access local support, it enables them to meet others living with the disease.